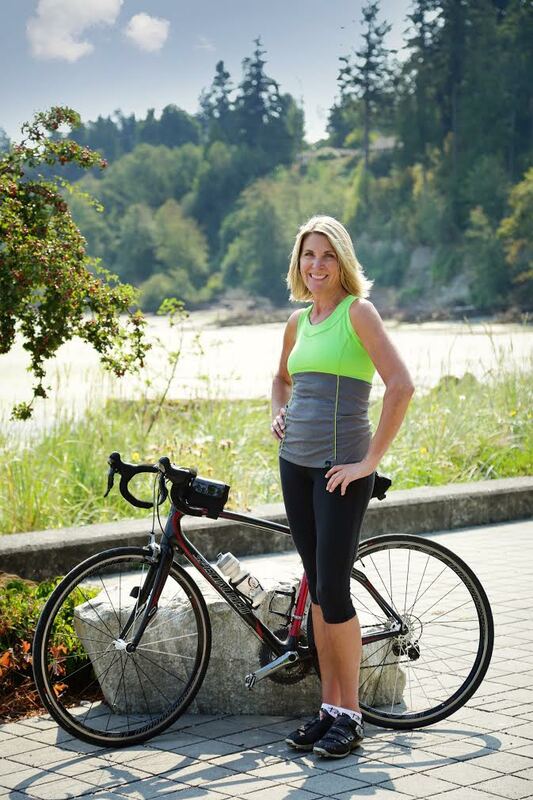 Meet Mary, co-founder of Tonik Cycling — the biking gear made for fit and performance for women with REAL bodies of all body types. Tonik was founded by two friends who loved to cycle but laughed until their sides hurt or dreaded coming out of the dressing room when they tried on cycling jerseys. Why was it so difficult to find functional and fun cycling clothes? So Tonik was born- their jerseys come in several colors/styles so there is something for everyone! For sizing, Tonik recommends you go by your t-shirt size for a comfortable, flattering fit. If you prefer a more tight fitting jersey- order a size down. Lisa and I are first and foremost outdoor enthusiasts. We are blessed to live on Whidbey Island, a beautiful island in the Puget Sound outside of Seattle, Washington. We love to run, hike, paddle-board and ski but our true love is cycling. We met as a group of women cyclists who were training to do a double century in Seattle. You were inspired by your personal experience to venture into the cycling industry- how has it been to make a name for yourself and Tonik? Tonik began when Lisa and I, along with five other women, were participating in a double century together and were on a mission to find cycling apparel we felt good in. Seven women, seven body types – and none of us could find cycling apparel that fit and flattered our bodies. And so we started Tonik – which means “solution,” as we are a fit solution. We strive to provide more fashionable options for women, and we are inspired by the fashion in other sports. We want our customers to look good and feel good. Our motto is "Real Jerseys for Real Women." What were some of the initial struggles you had with creating your brand? We had to start from scratch when it came to fit. Traditional cycling apparel has a lot of great options if you are an elite athlete or blessed with an iron woman body, but for the rest of us – shopping for cycling apparel is about as much fun as shopping for a swimsuit. Women who have had a difficult time finding cycling apparel have quit looking. It is sometimes difficult to get women to believe there is apparel out there that really fits. Our belief is, if you normally wear a size medium in your other clothing you should be able to wear a medium in cycling apparel as well. We wanted our clothing to take you comfortably from the bike to the coffee shop. That meant some changes – no elastic in the waste, long enough jerseys to cover the backside, room for the chest, etc. Also, bike shops can be a very intimidating place for women. We have shops seeking us out because we can fit their customers, but that is not true with all shops. It is tough to re-educate a male-dominated industry. We are inspired by the women who write our reviews, women who drag their friends to try our jerseys on, women who had resigned themselves to t-shirts or men’s jerseys. When they find us, and see how Tonik is truly different, it makes our hard work worth it. Why is it important for women to be involved with the industry, either as a consumer or employed? We understand this market because we are the market. Who better understands the needs of a woman cyclist better than a woman cyclist? We want women to feel comfortable and confident on their bikes, which is why we created Tonik. We want our fellow women to get out there, ride and have fun! What would be your favorite jersey from your current line and why? That is a tough one. I love the new Beth. It is lighter weight and I like the way it slenderizes. (Let's be honest – we need the technical features but we also love the way it looks). What inspires you to encourage more women to discover their life on two wheels? We travel to as many bike events as possible to tell people about Tonik. At these events, women try on our clothing and tell us their stories – stories of life-changing physical changes. At our last event in California, a woman told us how she had a relative die of diabetes and she was headed down that road, so she decided to change her life. She starting riding, lost 60 lbs, came off all her medications and is now controlling her diabetes with just her diet. She was loving life! We hear stories like these all the time. Cycling can change lives and is a sport you can enjoy at any age! It may sound silly, but when you have worked hard to become a cyclist and cannot find apparel to fit you, it is heartbreaking. Tonik takes pride in the fact that we fit XS-XXL! (And those are real sizes, not Italian). Any words of wisdom for those wishing to get involved with the industry and/or inspiring women to ride bikes? If you are lucky enough to know the joy of cycling, find a way to share it with other women. Work with your favorite bike shop or cycling club to start "women only" rides, beginner women rides, clinics and women's nights. Help create a place for women to learn and grow in cycling. And be supportive of all body types. We can make a difference if we inspire ALL women to bring out their inner athlete.